The holidays are, indeed, here! No doubt there’s lots to do this week with Thanksgiving a few days off, and Christmas right around the corner, but let us remind you that many terrific Six Flags theme parks across the country are rolling out a variety of entertaining festivities for family and friends looking to add a little extra pizzazz to the holiday season. Six Flags Entertainment’s annual holiday extravaganza — Holiday in the Park — features six participating Six Flags theme parks, each filled with delightful experiences to help create those special family fun outings during this magical time of the year. Their breathtaking winter wonderland features a variety of delightful and interactive activities to help capture the holiday spirit. Gather with your loved ones to enjoy sparkling lights, glamorous decorations, festive scents and seasonal treats, playful activities, hair-raising rides, and heartwarming shows. 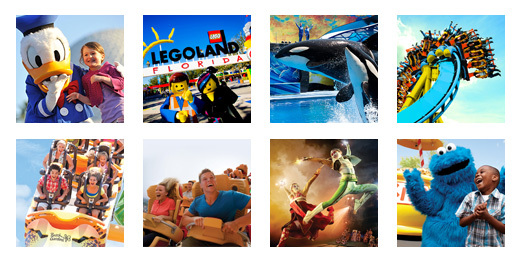 TicketsatWork.com has special deals for all six of the Six Flags theme parks that operate during the holidays. Take a day with the family to visit one of these six, wonderful Six Flags theme parks and see each one transformed into a winter wonderland with millions of twinkling lights during Holiday in the Park. Holiday in the Park: November 21 – January 3. Highlights 13 coasters, 3 children areas, and shows featuring sea lions and sea otters. Holiday highlight includes Gingerbread Junction with peppermint swirl-wrapped trees, a giant gingerbread man atop the carousel and the Gumdrop Hop dance party. A 200-acre family theme park located approximately 20 minutes from downtown San Antonio. Holiday in the Park: November 27 – January 3. As the original Six Flags park, it features more than 100 spectacular rides, shows and interactions. Enjoy the thrilling sensation of racing down a hill made of snow! Six Flags Discovery Kingdom is Northern California’s only combined marine life, wildlife, and wild rides theme park. The all-new Six Flags Dazzle at Discovery Kingdom is a breathtaking feast for the eyes with dancing lights illuminating the nighttime sky. Six Flags Entertainment’s ‘Holiday in the Park’ is a wonderful blend of great shows, rides and attractions for the whole family to enjoy this holiday season, so be sure to get your discount tickets from TicketsatWork.com!